Disney's newest kids' release Zootopia is now in theaters. As of now, it has a Rotten Tomatoes score of 100% hinting that a potential box office success might be right around the corner. 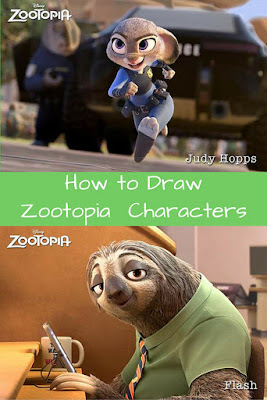 So, to celebrate this fun animated feature big screen debut, I'm pleased to present not one but two fun video tutorials showing you and your kids how to draw the beloved human-like animal characters from this new movie: Judy Hopps and Flash. Let your inner artist loose by watching and following along with professionals Byron Howard, co-director, and Cory Loftis, art director of characters, both of Zootopia fame. All you need is a pencil and paper or sketchpad to get started drawing and creating your own masterpieces. These easy-to-follow videos were produced by Walt Disney Animation Studios especially for those of you who love to draw and sketch or would like to learn how. Visit the official Zootopia website for more information and fun. FTC Disclosure: I did not receive any payment or other compensation in connection with this post and Disney provided all images and videos featured. See complete FTC Disclosure information that appears at the bottom of MommyBlogExpert's main page and at the bottom of every individual post on this blog, including this one.